Having grown up in Perth, Australia, seeing The Faim grow from the “small town heroes” they used to be is quite the shock – but where they were headed definitely wasn’t to be unexpected. With the amount of potential that they had displayed in the early days of the band, growth wasn’t out of the picture. 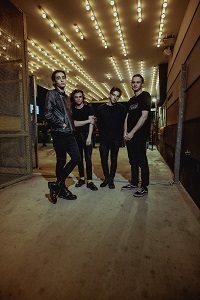 The Faim have begun to get a grip on their dreams and have now taken on multiple stages across the world, expanded their ability to perform even further and adapted to overcome pretty much anything that is thrown their way. Having had to adjust to the departure of drummer Sean Tighe, The Faim have seemly settled into the changes quite nicely. I spoke with the multitalented Stephen Beerkens for an inside on what is going on for the band and what life was like growing up, before touring with The Faim… however, I started by asking him the origin of the band name? The word ‘faim’ means ‘hunger’ in French. This represents our hunger to pursue our dream that drives us through everything that we do. We have a very wide range of influences, including Coldplay, Twenty One Pilots, The 1975 and Panic at the Disco. How does it feel to have grown from a small Perth band to now a world touring band? Was it something you ever expected to happen? This is something we’d always dreamed of, but not necessarily expected. Every show that we play on tour is such a surreal experience and we wouldn’t trade it out for anything. How does the dynamics between the band feel with the newer members? The dynamic is amazing. We’ve all been mates before becoming band members which definitely translates across to our energy in our live shows. What does the new album have in store for us? Will it be similar to the EP or is it a new turn? What the album and EP will have in common is their diversity. As genre is becoming so fluid these days, the music that we release will be an expression of all of our different musical influences. How does touring impact you all as a group, is it very stressful for you guys to go into this constant traveling lifestyle or are you taking it well? Touring does have its stressful times, but it’s always amongst the many amazing memories and friends made on the road. What made you choose the instruments you have now? Was it cost or was it a style/model/brand/colour preference? I play a Music Man Stingray 4 bass. I’ve always loved the look and sound of this bass and was stoked when I finally made it mine! What were you like growing up? Were you interested in music from a young age or were there other passions at first? I was into music from a very early age. I was also very into sports growing up so both of these took up a large amount of my time as a kid. What made you decide on being a musician? I started playing piano when I was seven and from then, my love for music continued to grow. Over time there became nothing else that I wanted to pursue but music. No clue! Music is all I ever think of! Playing amazing shows with my boys every night all over the world!! What are your favourite venues? Do you have any? One of my favourites has to be the O2 Forum in London! What are the main themes or topics for most of your songs? Do you think these topics will change over time? In our songs, we draw inspiration real life experiences that we’ve been through. That being said, as we grow as people and discover more about ourselves, these new experiences will have a large influence on our future writing. Could you briefly describe the music making process? When writing a song, we always have a clear concept in mind. In this way the song really means something to us and can in turn relate to others. Like any career, there are many challenges that we face as a band. No matter what it is though, we tackle it by being there for each other and approaching each challenge as a team. What is your favourite part about this line of work? Your least favourite? Why? My favourite part of what I do is seeing the positive impact that our music has on people. Whether it be online or in person at shows, it’s truly a surreal and rewarding experience. One of the harder parts is being away from family and friends for long periods of time. My favourite song right now is ‘Medicine’ by Bring Me The Horizon. What is the weirdest or funniest question you’ve ever been asked in an interview? What’s my favourite Tesco meal deal! We’re constantly evolving as a band and with our sound. This being said, I think our best releases are ahead of us as we continue to peruse new methods of writing and discover more about ourselves as musicians. We can’t wait to share what we have in store! Be true to yourselves and do something that will make you stand out from the crowd. Over time we will watch the growth of this fabulous band and see what else is to fall into their path. No matter what happens to The Faim it is clear that nothing will stop them from reaching their goals and creating music for many people to enjoy!